Norwegian authorities made the country’s tax lists publicly available and searchable once again on Wednesday. The lists reveal taxable income and net worth for everyone obligated to file tax returns in Norway, and show how much tax each individual actually paid for calendar year 2017, but the figures don’t necessarily reflect actual wealth or annual earnings. Norway nonetheless has a long tradition of making tax returns public, with Norwegian politicians arguing that open tax lists strengthen democracy and hinder tax evasion. The goal has always been to advance transparency and prompt taxpayers into being honest. If an individual’s taxable income and net worth (formue, literally “fortune”) seem too low, the theory is that neighbours, work colleagues or even relatives may raise questions that can force more disclosure. Not only the lists be searched to see what others have listed as their income, fortune and tax paid, taxpayers can see who has looked them up on the lists as well. That’s limited sheer snooping, but the annual release still grabs media attention, if not quite the frenzy of earlier years. A total of 4.8 million people and 317,000 companies paid NOK 573 billion in taxes to Norway for 2017. There’s been more recognition in recent years, however, that the numbers in the actual tax lists (which used to be made available in the form of large books placed in the lobby of City Hall, but which now are released online) can be far from realistic. Values of homes, cars and other assets carry taxable values, for example, that are often far below market value (just 25 percent of it in the case of a primary residence) while taxable income is listed after various deductions. What’s left, however, is still considered an illustration of how Norwegians contribute to the common good by what they pay in tax. Many are proud of how much tax they paid, and top honours for the most recent tax year went to Oslo-based investor and financier Kim Wahl. He paid a total of NOK 246 million in taxes (around USD 30 million), after building up a fortune through a fund that buys, restructures and sells companies, according to magazine Kapital. Norway’s 10 biggest taxpayers collectively paid in more than a billion kroner for 2017. They included investors and entrepreueurs and also those who have inherited wealth. 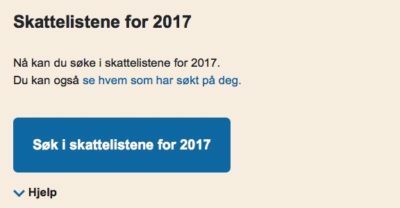 NRK published a list of the country’s top 100 taxpayers, and how much tax they paid, which can be found here (external link, in Norwegian, but scroll down to find the list).